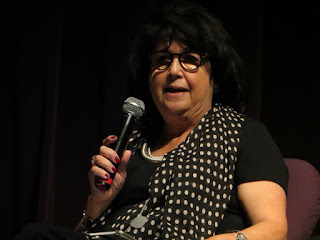 February 5: More people were sharing Anne Schwartz's awesome "Why I Am Not Quitting Teaching," but an equal number of people shared Emma Brown's story in the Washington Post, "Kids who took Common Core test online scored lower than those who used paper." This story is of particular interest to me, as I'll work with PARCC in my role with the Colorado Department of Education. February 6: Five folks shared some football fun from Desmos. Football season might be over, but math season never stops. February 7: The NYT story "Who Needs Advanced Math? Not Everybody" was shared by many people over several days, but on Sunday, seven people in the Math Ed Twitter list linked to it on Twitter. I'll comment a bit more about this below. February 8: NCTM helped get the word out about a recent TCM blog post, "Even and Odd Numbers, Part 2: A Journey into the Algebraic Thinking Practice of Justification." Taken seriously, it's the kind of article meant to have a dual effect: you think more deeply about how your students can think more deeply. 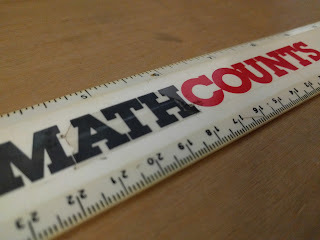 My MathCounts ruler from 7th grade is right at my desk. As an extra-curricular math program it had a positive impact on me. February 9: Peg Tyre's "The Math Revolution" in The Atlantic was a big hit this week. If you missed the article, it celebrates the successes of U.S. students in extra-curricular math programs while grappling with some of the difficulties of making such opportunities available to all. Commentary: I find the juxtaposition of two popular articles this week interesting: one that suggests fewer people need math (well, the title suggests that...the article/interview itself says...I'm not exactly sure what) and another ("The Math Revolution") that speaks of the benefits to students who get more math. Both articles made me think of Rochelle Gutiérrez's perspectives on equity, which seem to be on my mind lately. Gutiérrez defines equity in mathematics, in part, as "being unable to predict students' mathematics achievement and participation solely upon characteristics such as race, class, ethnicity, gender, beliefs, and proficiency in the dominant language" (p. 41, emphasis original). When someone suggests to me that some students might be fine with less mathematics, and some students might do well with more, I can believe they might be right. BUT, under current systems, I have equal reason to believe that systemic inequalities in our society and educational systems will affect which students tend to get less math and which get more math, and those differences will too often be predictable using the characteristics described by Gutiérrez. Thankfully, Peg Tyre addressed this issue in "The Math Revolution," but we need more than mentions in The Atlantic to solve the problem. February 10: Even more people shared "The Math Revolution," while an equal number linked to "Make a Mathy Valentine" by Ariel Zych on the Science Friday website. It's more or less a basic activity involving geometric transformations, but with hearts. February 11: Keith Devlin blogged "Theorem: You are exceptional." It's a fun and mathy thought-romp through the odds that each of us is really, really good at something. I saw someone mention that TMC registration was open, and I thought, "This weekend I should look into that." I snoozed, and it looks like I...losed? An announcement on Twitter said the conference filled to capacity and that there's now a registration waitlist. I imagine twittermathcamp.com will get updated soon with these details if it hasn't already by the time you read this. The TMC16 program is available if you'd like to know what you might miss. Don't forget that NCTM is accepting proposals for the new "Innov8" conference now! The proposal deadline is March 1. NCTM's call for chapters for the 2017 Annual Perspectives in Mathematics Education also has a March 1 deadline. The topic will be "Reflective and Collaborative Processes to Improve Mathematics Teaching," which sounds like it could be an outlet for my dissertation work if I feel like wrestling with NCTM to retain some/all of my authorship rights. There is a specific mention of the role of technology and social media...does anyone feel like co-authoring something with me? The intention to submit form asks for abstracts of 200 words or less, so good luck with your proposals, potential authors! The March 2016 Review of Educational Research is out but none of the articles are math-focused. Still, by some measures RER is the #1 journal in all of education research, so if you'd like to get a sense for what's on people's minds (like intelligent tutoring systems and digital games), the table of contents is worth a look. Informal online communities and networks as a source of teacher professional development: A review by Maria Macià and Iolanda García of the Universitat Oberta de Catalunya, Barcelona, Spain. It's a light week in the research world, it seems. Sure, there are a few "online first" articles that have popped up, but otherwise no new math ed research has appeared in the 30+ journals I'm checking each week. That's okay, because it will give you time to read up on an all-time great article that I recently summarized on the MathEd.net Wiki: Anna Sfard's "On the Dual Nature of Mathematical Conceptions: Reflections on Processes and Objects as Different Sides of the Same Coin (1991). If you want a nuanced view of process vs. object, and what it might mean when a student's "light bulb goes on," then I highly recommend you read this, or the original version if you have access. Rebekah Ottenbreit from CDE's Office of Culturally and Linguistically Diverse Education will be offering a session focused on helping classroom teachers and ESL/bilingual educators use tools and strategies to make mathematics content more accessible to English learners. The session is scheduled for March 8, in Greeley, and registration closes March 3rd. Scroll to the bottom of this page for location and reservation details. Math on the "Planes" is fast approaching! The conference is in Greenwood Village on February 26-27, and today (February 12) is the last day to book a hotel room at the conference rate.